Rocking back and forth does not come from the head but instead, it comes from the strength of the legs. Press your feet into your hands and your legs up. I have quite a flexible body so getting into Rocker has never been an issue. But, doing this exercise with strength and not just relying on my flexibility has been its own interesting journey. Rocker is not like the Bow pose in Yoga. 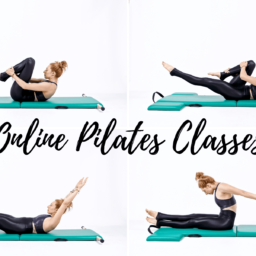 They look similar but in Pilates, you want to have your hands meet your feet to encourage connection of your arms to your back and your legs to your seat. The rocking back and forth does not come from the head but instead, it comes from the strength of the legs. It is absolutely ok to get into the exercise and think about Rocking or even to simply think about lifting into the position. Rocker is not like the Bow pose in Yoga. After you have completed a lot of your rolling exercises and opened up your chest you can flip onto your stomach. Trying to keep your legs together bend both knees and reach your arms back and ideally grab both legs at the same time. Lower your chest down and from your back pull on your legs 3x to connect to your upper back and open the front of the thigh. Then press the feet into your hands and allow the legs to lift your chest up as you reach it forward. Repeat that prep 2 more times and then hold yourself up on the third. Using your hamstrings and not your head (it's not easy) lift your legs to help tip you onto your chest or towards it. Then pressing the legs away tip back on to your thighs. Repeat 3-5 more times. Or, simply hold and think about how the back of your legs can help you rock back and forth. To keep this out of your lower back pull your pubic bone towards the mat and maintain the length in your lower back. While this is a big back bend it's still a rolling exercise and you're not letting it all hangout!